Uh, NAY!!! No way, hosay!!! :( I am not gay, and he isn't either!! And neither is Percy! Ugh!! Why are so many respuestas against his homosexuality? Only reason I say Nay is that I know Percy is straight...so it couldn't happen. (And we can't división, split up Percabeth...) Also, (DO NOT CONTINUE lectura THIS IF tu HAVE NOT FINISHED THE BLOOD OF OLYMPUS), Am I the only one who got a sense of Nico and Will having something for one another at the end??? Obviously NAY!!! Riordian bugged Nico with the gay thing. amor Rick, and amor Nico, but he just don't match with the gay thing. SON OF HADES!!! ._. Percabeth. 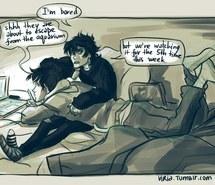 Not Nico and Percy. Nay. And Nico is not gay. Yea, he dicho he had a crush on Percy. But he even dicho he didn't feel that way anymore. BUT at the end of the blood of olympus he dicho he liked will solace! It's pretty one-sided for me. Yes, Nico had a crush on Percy. Tbh yay. But I also ship Percabeth and PerLia. So multishipping. ALSO TO ALL tu HOMOPHOBIC PPL WHO REFUSE TO BELIEVE NICO IS GAY WELL HE IS AND IT IS CANNON. SO IS SOLANGELO OK!!??? ?